The latest Discoverer AT3 XLT™ tires from Cooper® boast exceptional wear resistance and a rugged design. In our two-part HD video coverage, we begin with mounting and balancing a set of 37 x 12.50R17LT AT3 XLT™ tires for the magazine’s Ram 3500 pickup. These Load Range D tires rate 3,525-pound capacity per tire and engineering aimed at longevity. Join us at Discount Tire where mounting and balancing ready these oversized tires for our road testing. 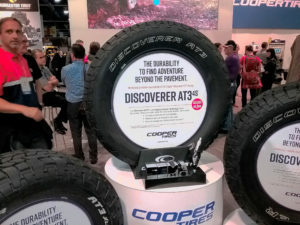 Part 1 HD video coverage includes an overview of Cooper Tires® Discoverer AT3 XLT™ tire technology and design features. Cooper® history dates to 1914, a legacy straight from the heartland of the American tire industry. Cooper® pride in quality and the company’s commitment to safety is apparent. The Discoverer AT3 XLT™ features described in the Part 1 video explain why these tires achieve longevity and offer a rugged hauling package. The 18/32″ tread depth contributes to the long service expectations. In addition to a “Standard Limited Warranty” and a “Free 45-Day Road Test”, Cooper® offers “60,000 Mile Treadwear Protection” on the LT-metric size Discoverer AT3 XLT™ tires. 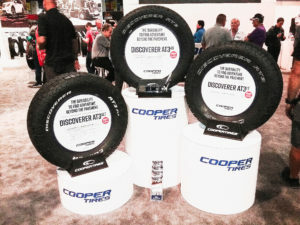 (See the Cooper® website at http://us.coopertire.com/ for more details.) Intensive Cooper® research and testing have led to these terms. Tires balanced to standard by the Discount Tire at Los Altos Parkway, Sparks, Nevada, our testing of the Cooper® Discoverer AT3 XLT™ tires is underway. Stay tuned for the Part 2 video coverage, a full tire evaluation with test details. We’re rolling! The Cooper® Discoverer series attracted a steady crowd at the 2018 SEMA Show. SEMA showcases the best products in the automotive market and aftermarket, and Cooper® is well-received annually. 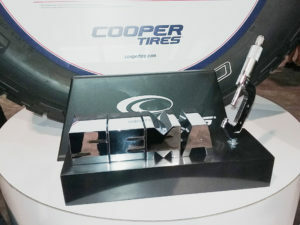 A coveted SEMA Award acknowledges Cooper®. At the leading edge of tire development, bent on customer satisfaction, the company and its products have earned these accolades.